Good. Fast Dispatch. Expedited UK Delivery Available. Excellent Customer Service. Hinges weak. Ex Library. I'm a lifelong King fan, and have read literally EVERYTHING he's written. Mr. King never disappoints, as Duma Key has the same great character development as all previous King novels. I was relieved that there were no awkward molestation/underage intimacy themes (which were prevalent in King's books there for a while). The details in his descriptions of the characters' surroundings makes it possible to almost SMELL the plants and HEAR the ocean! This isn't my favorite of King's works and it irritates me mightily when he injects his political beliefs, but all in all not a bad story. Bring on the next book! Like many Stephen King efforts, Duma Key is a novel rattling around in a horror story. Or, possibly, it?s the other way around. At its best, Duma is a buddy story, a portrait of two physically and mentally battered men seeking healing and redemption in friendship, art and ocean air. Mr. King obviously draws on his own physical rehab and his pain endows the story with grit and honesty. Of course, this is a Stephen King story, so witches and specters and malfeasances must muck around in an otherwise decent story. As a suspense writer, I find Mr. King highly overrated. A very few thrills are broken up by long stretches of chatty dialogue and tedious e-mail exchanges. 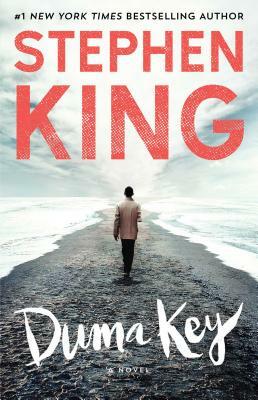 King?s strength is in writing about ordinary people in extraordinary circumstances, however, and the characters in Duma Key are particularly vivid. Freemantle?s battle with physical pain and anger, Wireman?s explosive secret and even Mrs. Eastlake?s losing battle against Alzheimer?s are all beautifully drawn and plot enough for most novels. I suspect some clever screenwriter will rework the ending, write out the evil witches and haunted house, and end up with an Oscar. Until then, we?re left another half masterpiece. Wow! What a read. And boy what a ride! This was my first Stephen King novel. I have always been apprehensive about his books because of their reputation for being SO frightening. As one who scares easily, I just stayed away from them. But I always felt I was missing out on a big piece of American pop culture so I decided on Duma Key as a good, middle-of-the-road scary book; scary, but not TOO scary. Turns out I was right. It gave me just the right amount of thrill without causing me to have to put it down in the middle and think every noise in the house is some evil, lurking THING out to get me! What captivated me about the book is Mr. King's talent for explaining the inner workings of someone's mind, their thoughts, fears, and creative processes, and this book is all about the creative process. You learn how a terribly injured person, who would almost rather die than keep living, straps on the belt of endurance and prepares for a hellava ride. Not only does he survive, but becomes better. I am a long time King fan and was really excited when he came out with this latest book. As always, he draws you into the center of his story, making it almost impossible not to know what happens next, while at the same time impossible to guess what happens next! So, you have to keep reading to find out. These characters, Edgar, Wireman and Jack, will live with me forever. I have met people and thought "that's Wireman!" or "that's Jack!" These guys have forever become ingrained in my head, along with Duma Key itself. Wonderful story by the master. You might find it a little slow at first but stay with it and I promie you'll love the ride!!! Yes, I would recommend the book to someone who is captured by the imagination of Stephen King. For myself, after Lisey's Story, which I could not finish, I swore off King. Then I gave "one more chance" to this, his newest novel. Maybe I was being unfair on the basis of one book. On Duma Key in Florida, a severely injured protagonist finds in his newly discovered artistic talent, a squirmy power to alter reality through his work on canvas. He takes a long time to realize that he is in thrall to the dark story of the Key, and that his empowerment is a terrible captivity. Here we have the paranormal, the personifications of evil, the imaginative color and the twisting plot line of the author. But even though I kept going to the end--a fine end, given the premises on which it builds--my problem persisted: I don't find his work interesting; the magic does not work for me. I was left with questions of just what in this genre appeals to so many people. For many it is, judging by the number of his sales. Why does it work for those who are devoted to it? You can hold his archetypal world up to the light--and light is a theme of this particular work--and stumble around in the human psyche, asking what attracts and why, by what are so many minds and emotional inner forces being drawn. As my father used to say, "It gives one furiously to think."